Everything a beginner needs to know about the Roth IRA all in one resource, including how to figure out if it's right for you. The Roth IRA is one of the best wealth-building tools at the disposal of the average American. Not only is it a handy way to put money away for your retirement savings, but it also offers a bevy of tax benefits that allows your nest egg to grow entirely tax free. That alone could be worth thousands -- or tens of thousands -- in additional wealth when you retire. Buckle in: We're going to take an in-depth look at everything you need to know about the Roth IRA, including the benefits, who's eligible, your contribution limits, and how it's different from a traditional IRA, 401(k), SEP IRA, or other retirement savings account. Most importantly, you should be able to determine whether a Roth IRA makes sense for you. The Roth IRA is an individual retirement plan with a number of tax benefits that can add up to thousands of dollars or more in extra money when you retire. While it's similar to a traditional IRA in many respects, there are a number of major differences in how the Roth IRA works, as well as limits on how much you can contribute in a given year, based on your income. The short version is that while contributions to a traditional IRA, 401(k), or other similar retirement plan are generally pre-tax, cutting your tax bill the year you make the contribution, you can't deduct Roth IRA contributions from your income. However, so long as you wait until after age 59 1/2 -- with a few other qualifications -- your Roth IRA distributions are tax-free. In other words, it's about as close to tax-free income as a retiree can get. But that doesn't necessarily make it absolutely perfect for everyone. To the contrary, there are situations where it may not be right for you. There are a handful of tax benefits the Roth IRA provides. Tax-free growth: Any contributions you make to a Roth IRA will grow tax-free for as long as the assets remain inside a Roth IRA. For instance, if you invest $1,000 in your Roth, and the investment increases in value by $100, $1,000, or even $100,000, you won't owe any taxes on on the proceeds if you sell that investment as a profit. This is also true of dividends you collect on interest from bonds, or almost any other income from yield-producing assets you could own in a Roth IRA. There's one caveat: A class of equities called master limited partnerships, or MLPs, may cause tax complications in a Roth or other retirement account, because of something called unrelated taxable business income, or UBTI. So it may be best to avoid many -- but not all -- of these investments in your Roth, traditional IRA, or other retirement accounts. Tax-free retirement income: This is what makes the Roth IRA so appealing to many people. Unlike distributions from a traditional IRA, a 401(k), and even a portion of many people's Social Security check, which are taxed at your marginal income tax rate, distributions taken in retirement from a Roth IRA are tax-free. The Roth here offers a number of benefits, particularly in years when you may need to take bigger distributions from your retirement accounts. For instance, if you decide to make a large purchase one year, or if you have higher-than-usual out-of-pocket medical expenses, being able to tap a larger distribution from your Roth could keep you from jumping into a higher tax bracket. Penalty-free withdrawals of contributions (even before retirement): With a traditional IRA or 401(k), you pay a pretty stiff penalty -- typically 10% -- if you take a withdrawal before turning 59 1/2. You'll also have to add the withdrawal back into your taxable income for the year, since you got a tax break the year you made the contribution. But with a Roth, you can withdraw all of your contribution dollars early, without being subject to any penalty. To further explain, let's say you have a Roth IRA that you've contributed $45,000 to over the past decade, and because of market returns, it's now worth $80,000. If you needed to tap that value for some reason -- any reason -- you could sell your investments and withdraw up to $45,000 tax- and penalty-free at any point. If you take out more -- tapping into your investing gains -- before turning 59 1/2, that may be subject to a penalty. While it's not advisable to withdraw any money from any retirement account before you retire, using your Roth as a first choice can be a much better move than paying big penalties and taxes if you take early withdrawals from a traditional IRA or 401(k). No required minimum distributions: Traditional IRAs, SEP IRAs, 401(k)s, and similar plans have something called required minimum distributions, or RMDs. RMDs require you to take, as the name implies, a minimum distribution each year starting the year you turn 70 1/2. There is a formula you follow that determines how much you must take each year, based on your age. The problem with this rule for many people is that they're forced to take out money they may not need, that they then must also pay income tax on, since distributions from retirement accounts with RMD requirements are also subject to income tax. The RMD rule doesn't apply to your Roth IRA, so you can continue growing assets held in your Roth completely tax-free and only tap the funds when you need them. No maximum age for contributions: Traditional IRAs don't permit contributions after you turn 70 1/2. And for most folks, that's not an issue. But if you continue working past this age, or your other investments generate excess income you don't need -- or you have to take RMDs you won't spend -- you can contribute that excess to your Roth and put it to work generating tax-free income and growth for later years or for your heirs. No taxes for your heirs: It's possible to leverage the Roth as a way to generate tax-free income for your survivors. For those who are the beneficiary of a spouse's Roth, they can simply roll it over into an account they own, or retitle it into their own name. For non-spouse heirs, it takes a little more work. They can't retitle the account or transfer it into an account in their name, and they're required to take minimum distributions starting the year they inherited it. But the tax-free nature of the Roth carries over, making it a tax-free gift. Once they take the distributions, they can do with them as they please. How is a Roth IRA different from other retirement accounts? Several of the benefits we've discussed are unique to the Roth, including the ability to withdraw your contributions penalty-free before retirement age, not having RMDs, no maximum age for contributions, and the ability to pass along to your heirs tax-free. The other big differences are related to the tax benefits and limits to how much you may -- or may not -- be allowed to contribute. First, the tax benefits. With most other retirement accounts, your contributions qualify as pre-tax income the year you make the contribution. For instance, if you contribute $5,000 to your 401(k) this year, your taxable income come tax season would be $5,000 lower, cutting your taxes. However, when you retire and start taking distributions, those distributions become taxable income. With a Roth, you can't subtract contributions today from your current taxable income, but as discussed, distributions from your Roth in retirement are tax-free. In other words, the Roth IRA is a hedge against future tax rates. If you expect your income tax rate in retirement will be higher than your tax rate this year, it makes sense to contribute as much as you can to a Roth. But if you expect your tax rate to fall in retirement -- the likely case for many people -- then Roth contributions may not make sense until you've already maxed out your other options first. If your income is between $122,000 and $137,000 for single filers or $193,000 and $203,000 for married joint filers, the amount you can contribute to a Roth IRA is on a sliding scale. If your income is over $137,000 or $203,000, respectively for single or married filers, you can't contribute to a Roth. Married single filers who lived with their spouse at any point during the year cannot earn more than $10,000, and their contributions are limited on a sliding scale starting from the first dollar earned. For the first time since 2013, the IRS increased the contribution limits for the Roth IRA and traditional IRA. Starting in 2019, the contribution limit was increased 9% from $5,500 to $6,000. Furthermore, for anyone 50 or older, the IRS allows for an additional $1,000 in "catch up" contributions, bumping your limit to $7,000 in 2019. However, as we've seen, your income may reduce the amount you can contribute. So long as your income is below $122,000 for single filers (that includes those who are married and filing single but didn't live with their spouse at any point during the year) and $203,000 for married joint filers, you can contribute up to the $6,000 limit ($7,000 if you're 50 or older), and if you earn more than $137,000 or $203,000 for single or married filers, respectively, you can't contribute anything at all. For those who earned an amount that results in a reduced contribution limit, there's a formula you can use to determine how much you can contribute. It goes like this: For every $1,500 a single filer makes above $122,000, subtract 10% from the $6,000 you can contribute if you're under 50, or the $7,000 if you're 50 or older. For married joint filers, subtract 10% for every $1,500 in earnings above $193,000. For example, a married 45-year-old who earned $197,000 in combined earnings with his or her spouse would have earned $4,000 above the limit, so that person would subtract $2,400 (40% of $6,000) from the contribution limit. So the maximum contribution would be $3,600 that year. Here's an important detail: Both spouses would qualify to contribute up to $3,600 each to their respective Roth IRAs, not a total between them. Lastly, you can't contribute more to a Roth IRA than your earnings. In other words, if you report $5,000 in income to the IRS in 2019, you wouldn't be able to contribute $6,000 to your Roth IRA. Does a Roth IRA make sense for you? There are two simple things to factor in when making the decision to use a Roth IRA: considering your "today" income tax rate versus your "retirement" tax rate, and benefits from your employer. For many people, your earnings today could put you in a relatively high tax bracket that's higher than the tax rate you're likely to pay in retirement. In that situation, starting with a Roth may not be a good call. That's particularly true if you're not maxing out contributions to a retirement plan, such as an SEP IRA, 401(k) or similar plan that deducts contributions from your taxable income now. Furthermore, if contributing to a Roth precludes you from taking advantage of matching contributions from an employer-sponsored retirement plan, you're leaving free money on the table. So before you even consider contributing to a Roth IRA, make sure your contributions to any employer-sponsored plan are high enough to get full advantage of any benefits your employer gives you, as well as fully maximizing tax-saving benefits if your current tax bracket is likely to be higher than you'll pay in retirement. If you're maxing out your 401(k) or similar and still have funds left over to invest for retirement, then by all means, take full advantage of the Roth IRA. On the other hand, if you don't have access to an employer-sponsored retirement plan, you may be better off with a traditional IRA depending on your tax situation, since you can deduct those contributions from your income the year they're made, as with a 401(k). But again, if you expect your tax rate will be higher when you retire than it is this year, then making contributions to a Roth IRA would be the better move. How do you open a Roth IRA? Whether you're looking to start saving for retirement for the first time or roll over assets from another account, almost every discount online broker offers a Roth IRA today. Furthermore, you can go to the brokers' websites and set one up within only a few minutes, though it will probably take a few days to fund it and start investing. Does the brokerage offer access to the investments you're looking for? Are its trading costs low? For instance, if you're looking to buy individual stocks, it may not make the most sense to open a Roth IRA with Vanguard, which is one of the world's biggest index fund managers. On the other side of the same coin, if you plan to invest primarily in Vanguard ETFs and index funds, then a Vanduard account, which gives you access to all of their funds with no trading fees, is probably the most logical. Furthermore, it's also worth considering what other kinds of accounts you may need in the future, such as a Rollover IRA, a taxable brokerage account, or even 529 College Savings or Coverdell Education Savings Accounts for your kids. If all else is equal, opening your Roth IRA with a broker that has the kinds of accounts you may need either now or in the future could make managing your finances a little easier. But every dollar you pay in fees to your broker is a dollar you no longer have working for your future. Frankly, I can't think of a single competitive advantage one broker could offer that makes it worth paying higher fees, so long as it has the kinds of accounts you need. How should you invest in a Roth IRA? While it varies based on your age (or, more specifically, how many years before you retire), most people would do best to maximize their exposure to stocks, particularly high-quality U.S. stocks. Over the past century-plus, no investment class has generated better long-term returns. For that reason, the No. 1 asset to own in your Roth IRA is stocks. If you're just getting started and not sure which stocks to buy, or if you don't have the time or inclination to research stocks, low-cost index funds can be a wonderful way to gain exposure to a large group of stocks without having to research individual companies. 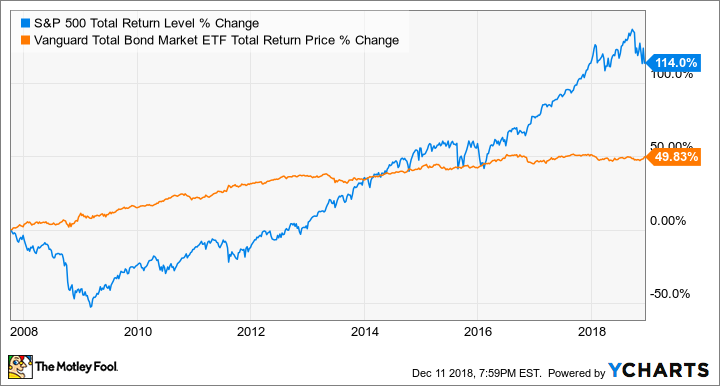 An excellent example of a good, low-cost index fund that's ideal for many investors is the Vanguard S&P 500 Index Fund (NYSEMKT:VOO). 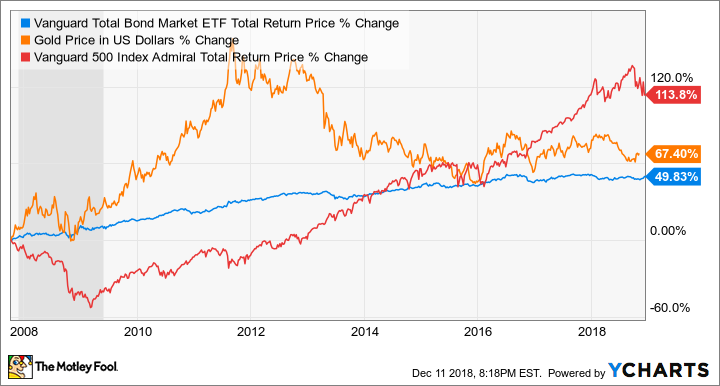 This fund tracks to the S&P 500 stock index, which is a collection of the 500 biggest publicly traded companies in the U.S., give or take a few, as the components can change as companies gain and lose value. Historically, the S&P 500 has generated around 10% in annualized total returns, significantly higher than other asset classes. What does this chart tell us? 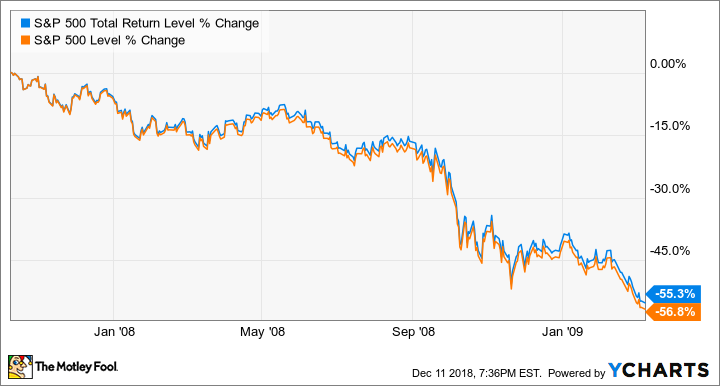 In short, that even after losing more than half its value during the Global Financial Crisis from 2007-2009, the S&P 500 still generated more than double the total returns of bonds and nearly double the gains of gold over the past 11 years. And that's why stocks should make up the vast majority of Roth IRA investments for anyone who's still a decade or more from retirement. The S&P 500 lost nearly 60% of its value from the pre-financial crisis peak to the market bottom 17 months later. 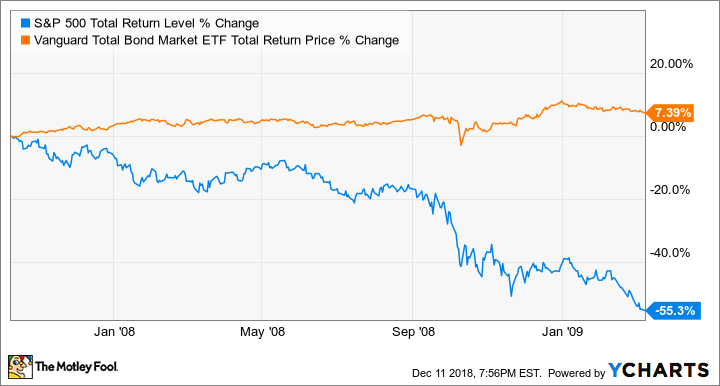 For anyone who needed to sell stocks over that period for income -- for instance, someone in retirement living off retirement savings -- seeing your portfolio lose half of its value would have been devastating. The takeaway isn't to avoid stocks, as the long-term performance should make abundantly clear. It's that they aren't ideal short-term holdings, because of the risk of sudden and unexpected losses right when you may need to sell. This is where bonds can come into play. Bonds, a vehicle that essentially lends money to a business or government, and bond funds tend to be far less volatile than stock prices. That's because a bond's value is simple to calculate: It's the dollar value of the bond when it matures, plus the remaining stream of interest the bond issuer will pay the bondholder. What's the risk with bonds? That the entity that issued it can't pay it and defaults on it. But since most corporate debt and nearly all government debt -- especially U.S. federal debt -- is safe and defaults are quite rare, the bond market in general is a fairly stable place to invest. For someone in or near retirement, keeping the assets that they were going to depend on for income over the next several years invested in bonds or a bond fund, it would have made a massive difference in their nest egg. The big takeaway in the stocks-versus-bonds debate is thus: Over the long term, stocks spend far more time going up than down. But they can fall quickly and sharply in the short term. And that succinctly describes why investing in stocks for the long term, and bonds or bond funds for the short term, is the best approach for most people. According to Motley Fool retirement expert Robert Brokamp, if you're more than a decade from retirement, you should put 5% or less of your retirement assets in bonds. Once you're 10 years or less out, the ideal amount is 25% in bonds, while steadily shifting the mix to 40% bonds when you retire. What should you avoid in your Roth IRA? If there's one asset class people should avoid at all costs, it's penny stocks. Penny stocks are generally classified as any stock that sells for near or less than $1 per share. And while occasionally reputable companies going through serious struggles may see their stock prices fall this low and still recover, the vast majority of penny stocks are unregulated and often not legitimate businesses at all. In short, if a company is below a certain size, it isn't required to submit audited financial reports to the Securities and Exchange Commission, the federal regulatory body that oversees public companies. This unfortunate loophole makes penny stocks a breeding ground for scammers looking to take advantage of uninformed investors. A common practice among penny stock scammers is the "pump and dump." This process often includes paid "advertorials" in so-called penny stock newsletters and posts on stock-picker message boards pumping up the prospects for a stock to double or triple (or more) in value over a short period. The usual result is that regular people get duped into buying shares, driving the price up quickly. What they don't realize is that they're buying shares at inflated prices from the scammers behind the "pump and dump" scheme, who built up their holdings weeks and months ahead of launching their scam. The people who get duped are left holding shares of a worthless company with no real prospects. Adding further insult to injury, the extremely illiquid nature of penny stocks makes it almost impossible to cash out any value after falling for one of these scams, since there aren't any buyers once the scam is up. In general, beginning investors should also avoid trading commodities such as oil or precious metals. These markets can be quite hard to predict, and it takes a certain amount of specialized knowledge and experience to become proficient at trading commodities profitably. Furthermore, many commodities are sold using contracts called futures, which are an agreement to buy or sell a commodity at a certain price on or a certain date. That means you can quickly lose a substantial amount of your investment in a particular commodity fairly quickly if the price of that commodity falls unexpectedly. Add it all up, and commodities are a better way for beginners to lose money than profit. Depending on your tax status and income, a Roth IRA may or may not be the best retirement savings vehicle for you. It's also good to remember that as your earnings and tax bracket change over time, it's a good idea to re-evaluate your situation. Just because contributing to a Roth makes sense one year doesn't mean it will always be the case, and vice-versa. But if you're contributing to a Roth, utilizing it to the fullest extent to build long-term wealth can make a huge difference in your quality of life in retirement.